Do you need a Pacific Beach beehive removed? Look no further than D-Tek Live Bee Removal for all your Pacific Beach bee hive roblems. We can permanently solve your bee infestation. D-Tek Live Bee Removal specializes in the safe, humane, live removal of honey bees from homes and businesses in Pacific Beach. We use a custom designed vacuum system that gently removes the honey bees. After the honey bees have been removed we drop them off to our very own San Diego beekeeper on our apiary. Question – Is it necessary to remove all of the honey comb? Answer – Yes it is for three reasons. 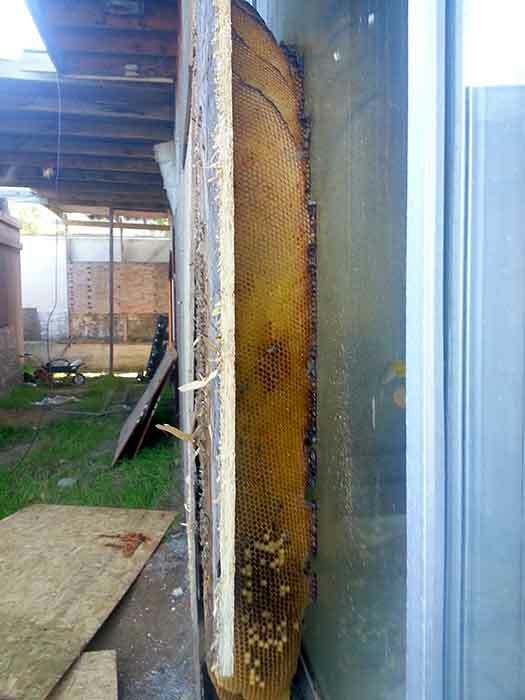 The first reason is if honey comb is left inside the structure more often than not the honey will start to melt out. This can cause damage to stucco, siding, drywall, electrical wiring, etc. The bee hive that is left behind will also be a magnet for other common household pests such as ants, rats, mice, etc. The third and final reason you need to completely remove all bee hive is because honey bees have an excellent sense of smell. Any bee hive that is left behind will be irresistible for other bee swarms in the area. Even if they are not able to gain access to the old bee hive you will more than likely have a bee swarm land and take up residence somewhere very close to the original point of infestation. Question – Do I need to worry about my roof, stucco, or siding leaking if you have to cut into it to fully remove all honey comb? Answer – No you do not. We perform over a thousand live bee removals each year in San Diego County. D-Tek Live Bee Removal has never had a roof, stucco, or siding leak. We guarantee in writing all repairs to be leak free and defect free. Those are the two most common questions we get asked by our clients. We know it can make people nervous at the thought of a saw cutting into a roof, siding, or stucco. All of our technicians are live bee removal experts and also construction repair experts. You are in good hands by choosing D-Tek Live Bee Removal for your bee problem in Pacific Beach. The live bee removal has been completed and all bee removal repair work finished. What now you may ask? There is one final step in the Pacific Beach bee removal process. This is the bee proofing and bee control services. No one wants to have a recurring honey bee problem at their Pacific Beach home or business. Our expert technicians will go over every crack, crevice, vent, and hole in a 10 foot radius from the original entry/exit point of the honey bees. We guarantee all of our bee control services to be honey bee free! D-Tek Live Bee Removal also offers whole home or business bee control services in Pacific Beach. We will go over every vent, hole, crack , crevice, irrigation box, light fixture, etc and make sure your whole property is sealed up as tight as can be. D-Tek Live Bee Removal offers free estimates and inspections. We are also available 24/7 for your Pacific Beach bee removal emergency. Our phone number is 760-224-3040. Don’t see the location you are having a bee problem in? Just give D-Tek Live Bee Removal a call and we will come to your Pacific Beach home or business and give you a free estimate and inspection. Our direct line is 760-224-3040. If we do not answer please leave a message and we will call you back. Usually within an hour. If you would prefer you can email us . Leave your name, number, and email address and we will contact you ASAP regarding your bee problem in Pacific Beach.